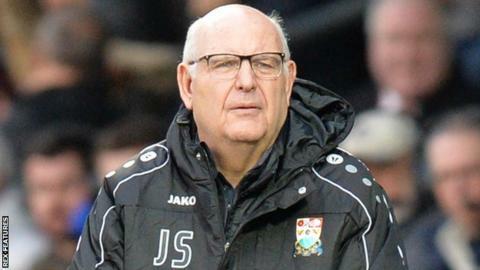 John Still has stepped down as Barnet boss and will retire from football management after 42 years. The 68-year-old, who began managing non-league Leytonstone in 1976, ends his third spell at Barnet with the club in 15th place in the National League. He will take on the role of Bees head of football, with Darren Currie in temporary charge of the first team. Still had three spells as Dagenham & Redbridge boss, leading them to the EFL for the first time in 2007. He also managed Peterborough United and Luton Town while in the Football League and had a spell as Bristol Rovers’ assistant manager. “I have managed in over 2,000 matches and had a fantastic time in the game to date,” Still told the Barnet website. Still is the only man to have led sides to promotion from non-league to the English Football League on three occasions. He first took Maidstone United into the old Division Four in 1989, won the Conference title with Dagenham in 2007 and then repeated that feat at Luton Town in 2014. He also oversaw the Daggers’ promotion to League One after winning the 2010 play-off final at Wembley. Still became Barnet manager for a third time in May, shortly after ending his third spell as Daggers boss, with the Bees having just been relegated from League Two. “Recovering from relegation from the EFL was always going to be difficult and we needed an experienced head to guide us through the turbulent summer,” added Barnet chairman Tony Kleanthous. “John’s record in the National League is second to none and having steadied the ship, we are now in good shape to push forward in 2019.